The Tricentennary is nearly upon us, so in order to prepare for the special day, it’s once again time to gather up everything that we know about Fallout 76 since it was revealed at E3 2018. There are a bunch of trailers, some explanations about how it’ll play, and the release dates for both the beta and the game itself. You can find all of this, along with everything else we know about the game so far, including any hidden details that could hint at what is to come. What is Fallout 76’s release date? Fallout 76’s release date is November 14th, and there will also be a public beta (or “Break-it Early Test Application” as they dubbed it). The beta will take place on October 30th for PC and is guaranteed for those who have pre-ordered the game at participating retailers, but access will be drip-fed all the way up to the game’s release date. Sadly for those who fancy having all the world’s Fallout 76 stuff, the Power Armor Edition has now sold out. It included a glow-in-the-dark map of the region and some figures, as well as a wearable T-51 helmet. It was only available inside the US, anyway. What are the Fallout 76 system requirements? That said, the early impressions of even the Xbox One X version show that the game may have some performance issues, though the video below is based on a pre-beta version of the game. It’s possible that the game will have better performance on PC and we’ll update you with any further analysis on performance as it arises. When does the Fallout 76 beta run from? On PC, you’ll be able to play the beta if you pre-ordered the game on Tuesday 30th October. While we don’t currently know what times the beta will be running on PC, we can look at the schedule from the Xbox beta that has been running. The first session began at 00:00 (BST) on Wednesday 24th October and lasted for four hours. The next two sessions will be running on 22:00 (BST) until 00:00 (BST) on Saturday 27th October, lasting a total of two hours; while a second weekend session will be running from 16:00 (GMT) until 18:00 (GMT). Note that the clocks go back this weekend, so this is why the time zones are different. So what we can deduce from that is that the first session on Tuesday 30th October will likely be a longer session, followed up by a couple of other sessions lasting a couple of hours at a time. However, this is certainly not a confirmation and we will be updating this article once Bethesda announces the beta’s schedule. What does the Fallout 76 beta contain? Bethesda have said that the beta is the full game and that the current plan is for any progress made during the beta period to carry over to the full game at launch, though the details of this are still coming. This means that it’s entirely possible to be able to do anything you would do in the main game, such as venture through the Appalachian region to cross state borders from the main state of West Virginia, set up a camp with friends, shoot enemies/other players, or even drop an atom bomb on a rival’s camp. What are Fallout 76’s “Atoms”? While you play Fallout 76, you’ll earn a currency called Atoms by completing various gameplay challenges and achievements. This “currency” can be used to acquire cosmetic customisation items for your character. On top of this, when Fallout 76 officially launches, Atoms will be able to be purchased separately for real money, however you can apparently get plenty of Atoms without the need to sink in real money. When and where does Fallout 76 take place? As if the music choice in the trailers didn’t give the game away already, Fallout 76 will be set in the Appalachian region, housing the entire state of West Virginia and parts of the surrounding states. Beyond that though, there are more subtle touches that hint at just how much is crammed into the map. Todd Howard did mention during the Microsoft conference that the map would be four times the size of any previous Fallout game. As mentioned during our latest video, the area is split into six different regions. Vault 76 opens somewhere in the forest region, but there is also the Toxic Valley, The Mire, Savage Divide, Ash Heap, and Cranberry Bog. Only Cranberry Bog is based on a real location, though individual buildings are also all over the place. There’s a little more lore out there about Vault 76, as according to a terminal in the Citadel in Fallout 3, Vault 76 “…will operate exactly according to the plan dictated in the marketing material produced by Vault-Tec and precisely to resident expectations. 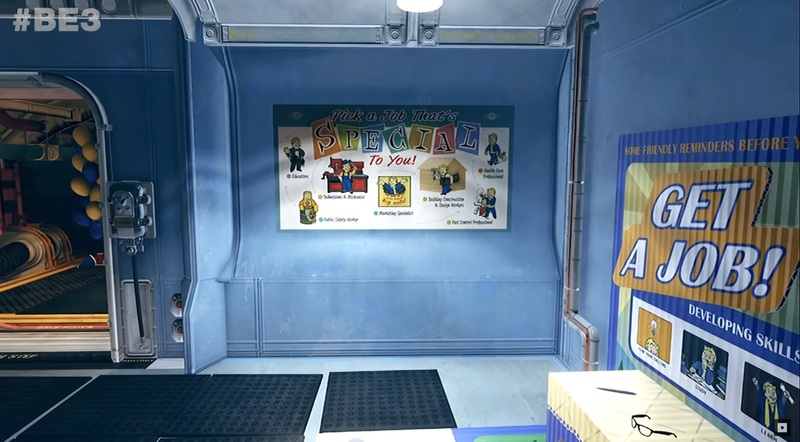 This vault will open automatically after a period of 20 years and the residents will be pushed back into the open world for study in comparison to the other experiments.” This didn’t really happen though as the opening of the Vault was delayed until the year 2102 when, presumably, the events of Fallout 76 take place. Things also didn’t go all that smoothly in the construction of the Vault as the Assistant CEO of Vault-Tec – Giles Wolstencroft was abducted by aliens while inspecting the construction of Vault 76. From the audio-log found in Fallout 3, there’s no reason to suggest that Giles made it back after some electronic shock experiments. Vault 76’s completion is also briefly mentioned by a newscaster in Fallout 4. One thing that while a lot of the game did seem rather familiar, such as how crafting works (even with the addition of the new crafting table), or how weapon customisation works, it did seem rather strange in the previews from outlets such as GameSpot was the lack of people. Of course, being set only 25 years after the bombs dropped helps explain this, but it does seem odd that the only humans you see are other players from a quest-giving perspective. Some are triggered by radio stations, while others as you enter areas. Firstly, other players can attack you without notice. There does seem to a sort of pacifism perk that all new players have until level 5. From that point onwards, you are open to be attacked at any time since the perk will be removed. You will take reduced damage until you attack back. If you can kill them, you’ll be able to loot their bodies in order to obtain some caps, and other interesting items. A bounty will be set on offending players who murder those without a bounty on their head, allowing others in the server to hunt them for an increased cap reward. When you die, you leave behind a “death bag” of sorts, which will contain all your junk. You’ll be able to respawn nearby should you so wish, allowing you to make a mad dash for your dropped loot. I’ve not found any information about what happens if you die again or leave the death bag lying around for too long, but this will be updated once the information comes to light. You can go at it all alone of course, but Fallout 76 encourages players to team up and work together. Players can party up with three other players to raid locations, complete quests, build communities, or just have a nice jam on a cliffside. It’s unclear how robust the online harassment controls will be, but early indications show that they seem to have thought of the least provocative solution, which is encouraging. Radio stations will also apparently be used to initiate PVP focused missions. The idea was first conceived four years ago according to Bethesda’s Todd Howard, with elements of open world survival. He describes the game as “soft-core survival” where death isn’t permanent and characters are only linked to a dedicated server. There will be a short pool of players rather than everyone playing all at once in one place, with players able to team up with up to four of them, and progression in your personal campaign goes with you. In a series of videos that are done in the style of Vault-Tec vignettes, we get an idea of the various concepts behind it. Todd Howard did later confirm in an interview with Geoff Keighley that VATS is there for targeting specific parts, but it will now be in real time. The way it seems to work is that you don’t specifically aim at limbs anymore by default, requiring a perk card to do so, but you are able to move around while in VATS to shoot enemies without requiring to aim at them too much. Much like the survival mode in Fallout 4, there is now a hunger and thirst bar above your health bar, meaning you’ll need to manage your intake of food and drink a little more. However this seems to be a slightly simplified variant, focusing on the player’s individual hunger and thirst as opposed to that of the settlements nearby. 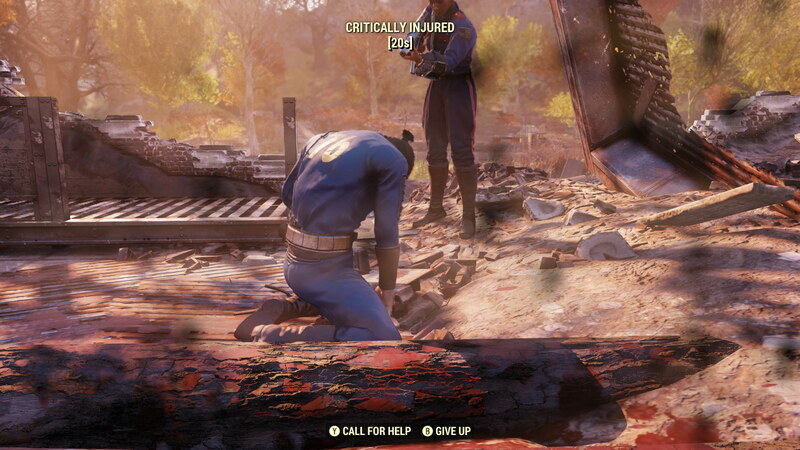 Levelling up seems to have been drastically changed in Fallout 76. When you level up, you’ll be able to sink a point into one of the SPECIAL stats. But for the actual perks themselves, those will be handled by Perk Cards that are obtained after levelling up. Each of the SPECIAL stats has associated perks that can be equipped, though you don’t need to choose the perk with the corresponding SPECIAL stat you increased. You’ll of course need to have enough points in the relevant SPECIAL stat to equip that Perk Card, however they can be shared with your team (provided you have three points in Charisma) and you can swap them out at any time. Any duplicates that you find can also be combined to make better versions of those cards. For example, the perk card “Gladiator” would normally increase one-handed melee weapon damage by 10%, however if you combine with a duplicate card, you’ll be able to combine them to increase the one-handed melee weapon damage increase to 20%. What was shown in the Fallout 76 E3 trailers? We first got a good glimpse of Fallout 76 at E3 during Microsoft’s conference. Here we see a fair few of the locations in West Virginia in varying states of disrepair, such as the state capitol, the Greenbrier Resort, and West Virginia university to name a few. Given the colour of the trees, it seems to be once again set in the autumn as the trees have a wide range of colours on display. In the subsequent presentation at Bethesda’s conference later that night, we were introduced to some of the creatures based on the folklore of West Virginia, including one seen on a cover of a pulp fiction booklet called “The Beast of Grafton” which is based on the Grafton Monster. There are other nasty beasties: A giant sloth with mold on its back, a spider with a hornet’s nest on its bum – which incidentally came straight from my nightmares, and even this flying bat monster ripped straight out of the Batman comics if that silhouette is anything to go by. What else can I do in Fallout 76? 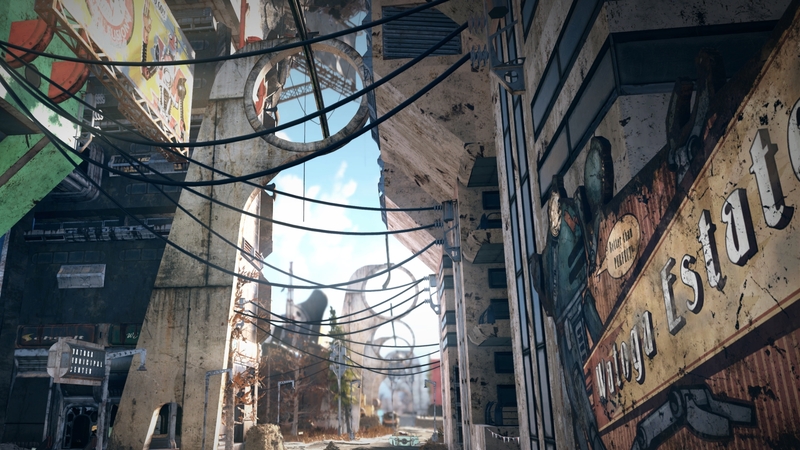 Unlike Fallout 4 where crafting was limited to safe locations, Fallout 76 gives players the option to build wherever they want. If you want to build your castle in the middle of a swamp, using the all new “C.A.M.P.” or “Construction and Assembly Mobile Platform”, then you’re free to do so. It still requires resources to build everything from buildings to turrets, but there’s also a larger emphasis on needing certain skills to make certain items. There also seems to be a hunger and thirst meter, which may be unfamiliar to those who never touched the survival mode in Fallout 4. Perhaps technology to purify water will be easily made within Fallout 76, though too early to help the overseer of Vault 101 from Fallout 3. Fallout 76 also, perhaps unwisely, gives players the opportunity to press the nuclear button. These require the acquisition of launch codes, which you and others can possess to drop the atom bomb on an unsuspecting foe. Once dropped, the landscape will change dramatically and even introduce new resources and mutated wildlife to suit the new surroundings. Any other information regarding Fallout 76? Fallout 76 will be Bethesda Game Studio’s main focus this year as other projects are being held back until 2019 and beyond. However there is no season pass, in a clear departure from how Fallout 4 did things. Instead they’re going to introduce new stuff for free during the game’s lifespan, and rely on cosmetic items as part of a micro-transaction strategy. And that’s everything we have for you that we could gleam from the internet so far. As always, we will be keeping this hub updated when new things are announced or discovered up until the game is out on November 14th, and afterwards should expandable content be coming to Fallout 76.